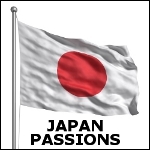 By voting on the books listed, you can help to determine whether a book is related to the theme of Japan Passions, or whether it is a non-related, but popular, book among the members of the site. If you believe a book in the list below is 'on theme' with Japan Passions, vote that it is relevant. (If you don't know, just skip it.) Over time, we hope to have a library of books that should be of interest to Japan Passions members. But you can also use this book along with the four hours of recordings included in the Living Language Complete Japanese: The Basics compact disc package, which also includes a handy learner’s dictionary.